A recurring theme caused Range Resources, QEP Resources, Gulfport Energy, SM Energy, and Callon Petroleum to all drop by double digits last month. Oil and gas stocks had been riding high over the past year thanks to a significant improvement in commodity prices. However, that recovery hit a speed bump last month due to several factors. While crude prices were basically flat, natural gas prices plunged almost 20%. Meanwhile, several producers reported fourth-quarter results and 2017 outlooks that didn't sit well with investors. QEP Resources plunged after reporting a fourth-quarter loss of $0.56 per share, which was $0.34 per share less than analysts expected. One of the factors contributing to the miss was a 2% drop in production, including a 5% slide in oil output, though the company expects to reverse that decline next year. That weak report, when combined with slumping gas prices, was more than enough to fuel QEP's sell-off last month. Next up was SM Energy, which reported a net loss of $0.31 per share for the fourth quarter, though that was a $0.10-per-share improvement to what analysts expected. What seemed to bother investors last month were some of its other updates. First, the company said that it expected its Eagle Ford asset sale to close by the end of the month, but it subsequently postponed the closing until mid-March causing concern that the deal might not close. In addition, it put forth a growth-focused capital budget based on $55 oil and $3.30 gas. However, investors are starting to worry that it might need to revise that spending plan after gas prices plunged closer to $2.50 by the end of the month. Gulfport Energy also reported fourth-quarter results last month, earning $0.34 per share, which as $0.12 per share ahead of the consensus estimate. What investors didn't seem to like about the report was Gulfport Energy's plan to ramp up drilling activities and grow output by 45% to 53% per day this year, with natural gas accounting for 88% of that production. That gas-heavy forecast didn't sit well, especially given that gas prices plunged last month due to another warmer-than-normal winter causing investors to fear that supplies could grow out of control. Callon Petroleum also sold off following the release of its fourth-quarter results and 2017 guidance. While the driller did earn $0.08 per share, that was $0.02 per share below expectations after production not only missed its guidance but was well short of analysts' forecasts, which were toward the higher end of the range. On top of that, the company released an ambitious 2017 budget calling for capex in the range of $325 million to $350 million, which was more than analysts were expecting. Analysts fear that Callon Petroleum might be getting too aggressive, especially considering how fragile the oil and gas market are these days. Finally, Range Resources sold off last month largely due to declining gas prices. That's because the company's fourth-quarter results were solid, with earnings of $0.23 per share, which trounced the consensus estimate by $0.13 per share. However, like the others on this list, its gas-focused growth plan seems to have bothered investors the most. Overall, Range Resources plans to boost spending this year and organically grow production by 20%. However, with gas prices weakening, it's calling into question the logic behind growing output at such a rapid rate because rising supplies could put even more pressure on gas prices. 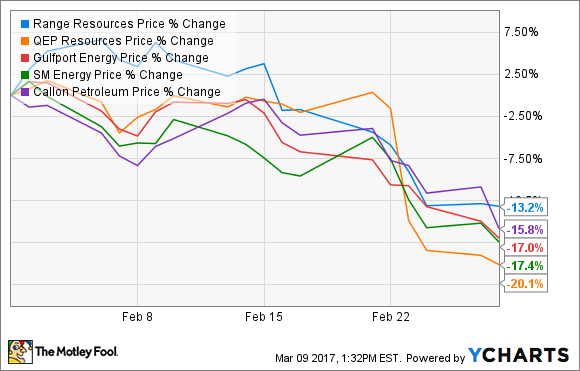 There was one overarching theme that fueled last month's sell-off in these five stocks: Each company is planning to boost production this year despite oil and gas prices remaining weak, with gas prices falling significantly last month due to tepid demand resulting from another warm winter. The concern is that these decisions to increase spending could come back to haunt these companies because the incremental output could put even more pressure on oil and gas prices, adding more weight to the stocks.